Marvel Two-in-One #58: To the Nth Power! As Ben is about to be brain-fried by Klaw, Klaw is mysteriously disincorporated back into his sonic claw. We see standing over him a recostumed Wundarr, now self-named the Aquarian and fully reborn with a functional adult mind thanks to the Cosmic Cube. It was the Aquarian's power-inhibiting null-field that has shut down Klaw. After taking care of the injured Giant-Man and Quasar, and seeing to the reimprisonment of Solarr and Klaw, the two head for a spatial distortion down below that the Aquarian has been sensing. It turns out to be Dr. Thomas Lightner, now in the form of a giant man-shaped hole in the air which seems to be sucking everything near it into it. Lightner now calls himself the Nth Man. Throwing things at him just results in his absorbing them (and growing larger). The Aquarian tries to shut him down with his null-field, and it seems on the verge of working, svae that in doing so he's shutting down the life support systems and killing Ben and everyone else. This is part six of the six-part Project Pegasus saga, which runs from MTIO 53 to MTIO 58. All six issues (plus issue 60) were reprinted in 1988 in trade paperback as The Project Pegasus Saga. This is far from the final fate of Dr. Thomas Lightner. His next appearance is in, of all places, the Squadron Supreme Death of a Universe graphic novel. From there, it looks like he'll go on to be a major player in the Squadron Supreme universe, under the name Mysterium. We learn in this issue that Giant-Man is dying from radiation poisoning he contracted in fighting Atom-Smasher in issue 3 of the Black Goliath book, which explains a lot of his odd behavior here. We'll see this addressed again later in MTIO starting in about issue 81. Finally, one of my pride and joys. 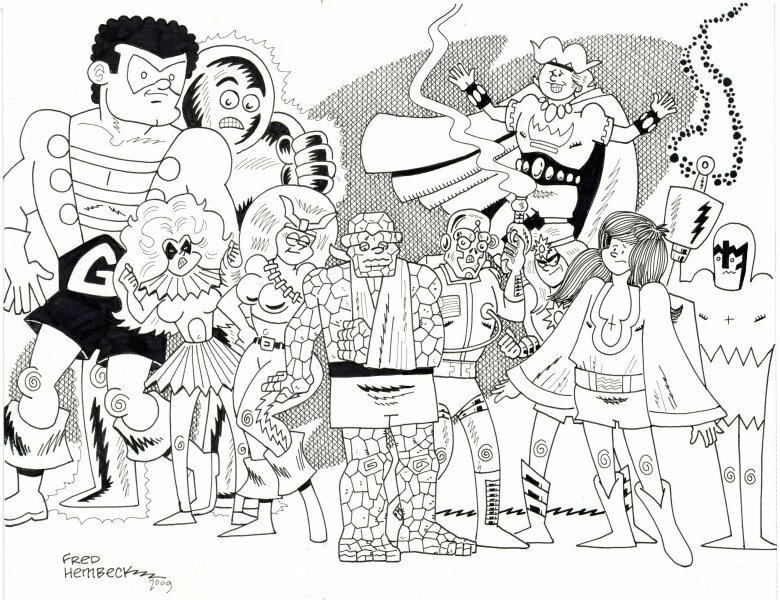 I think every comics fan loves Fred Hembeck, and at his site he has a section of what he calls Across the Page drawings. I hit upon the bright idea of asking him to do one of these with a Project: PEGASUS theme, and what he sent back is just plain wonderful.